It is another appreciation week on my blog, Laura y Oriol Grande Fiesta. I present you 2 Spanish chefs (I don’t believe you guys are actually doctors) who cooked fabulous food for us. 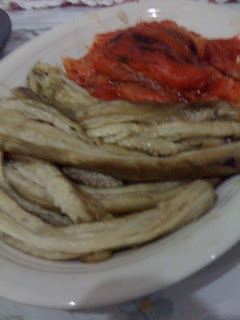 If you know all about Spanish food, you can skip this part. 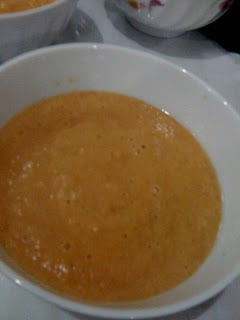 Gazpacho: Blended tomato, red pepper, onion, garlic, and cucumber soup with a hint of olive oil and vinegar. 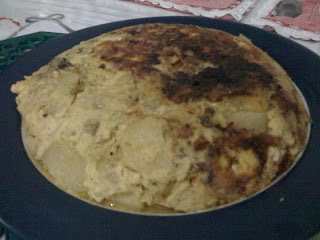 Tortilla de patatas: Potato Omelette. 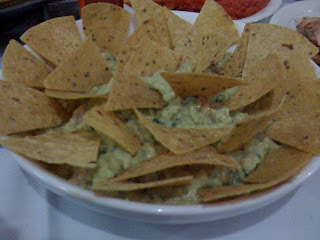 Nachos con Guacamole: Avocado sauce with tomato, coriander, and cream cheese, served with nachos. 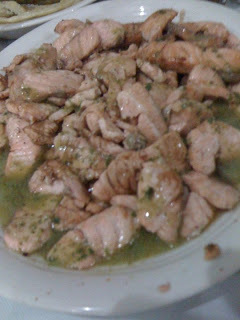 Salmon with balsamic and pesto sauce: Signature dish of the day. Lightly grilled salmon with caramelised balsamic vinegar and pesto (olive oil, pine nut, basil, and parmesan) sauce. 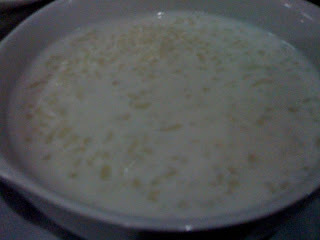 Arroz con leche: Rice with milk cooked with lemon peel, sugar and cinnamon stick. It all started in Setiabudhi where we gathered all the ingredients for the night’s fiesta (no, I don’t get paid for advertising the store :P). After much debate on what ingredients to buy and with double and triple checking of the stuffs needed, we still missed the main ingredient: parmesan (mainly due to my mistake on thinking cheddar = parmesan). Without further ado, we begin the night with two starters. We have Gazpacho soup and Tortilla de patatas. Gazpacho on its own presented us with taste-building appetite perfect to open the night. The soup was both savoury and fresh. For an extra fill, we can dip toasted bread into it. Our second starter for the night was a massive potato omelette. I don’t want to think how much carb it had, but it was very tasty and filling, especially if you put extra pesto sauce on it. The next three dishes could actually be enjoyed together, but the salmon is written last to put an emphasis on. Nachos con Guacamole is originated from Mexico. It provides the crisp taste for the meal. Escalivada was my favourite vegetable dish. They were simply baked and peeled off with a generous pour of salt and olive oil. What makes the Salmon with balsamic and pesto sauce special? It was the couple’s signature dish, perfected after years of evolution. Described as a Spanish cuisine with Mediterranean influence, the salmon was mixed with balsamic vinegar and generously poured pesto sauce. The combination gave us a rich and unique flavour of juicy pink salmon, sweet and strong balsamic vinegar, and tasty pesto sauce. By the time we finish the dishes, we hardly have any space left on our tummy. Luckily, the dessert, Arroz con leche, was actually better when refrigerated first. Oriol illustrated this dessert as an alternative way to enjoy rice; and he was right. With the added sprinkle of cinnamon powder, Arroz con leche was refreshingly sweet. Laura and Oriol are both from Barcelona, Catalonia (not España!). Although similar to Spanish language, Catalans have their own dialect,culture and/or food. Additionally, their city is home of the world’s best restaurant, El Bulli.